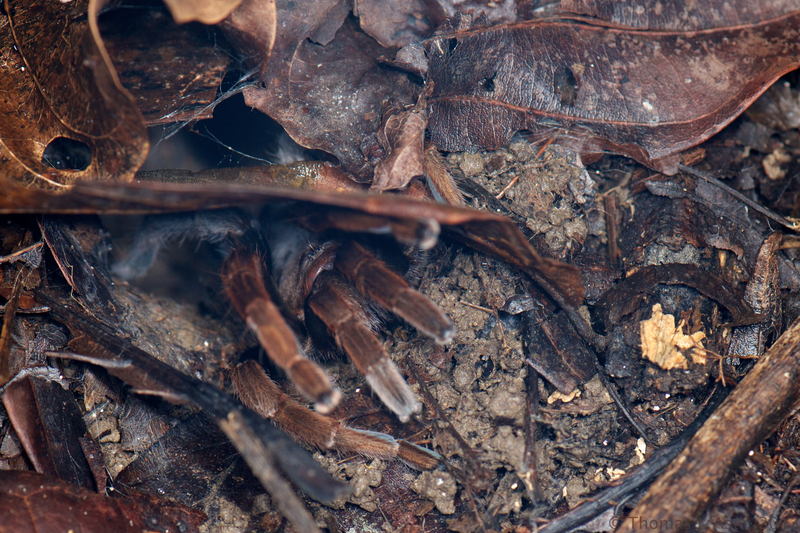 While walking at night on a nature trail in the jungle near the lodge, a tarantula scurried through the beam from my headlamp, off the path and into the leaves. I knelt down to lift the leaves to look for it, and discovered it had actually retreated into its burrow. Now, two days before, a man knowledgeable about such things, one of the other people at the photo workshop (Roy Dunn, a great guy and a wonderful photographer, you should check out his amazing hummingbird photos — http://quickblink.com/), “fished” for a tarantula living under the cement slab front stoop of a house. He used a very slender twig, and gently wiggled it into the tarantula’s burrow until the spider grabbed it. Then he slowly pulled the twig out with the tarantula clamped on, and voila, photo-op. So I thought I’d try the same trick. My son Thomas was coming up the trail behind me, so while he aimed his camera, I found a twig. It worked like a charm. The spider didn’t come all the way out, but enough for a couple of photos. I took this one when Thomas had a turn luring the spider out. Fathers and sons, fishing together… it was a Hallmark moment.